The idea that laid the foundation for our proposal was the very concept of Mesteshukar. 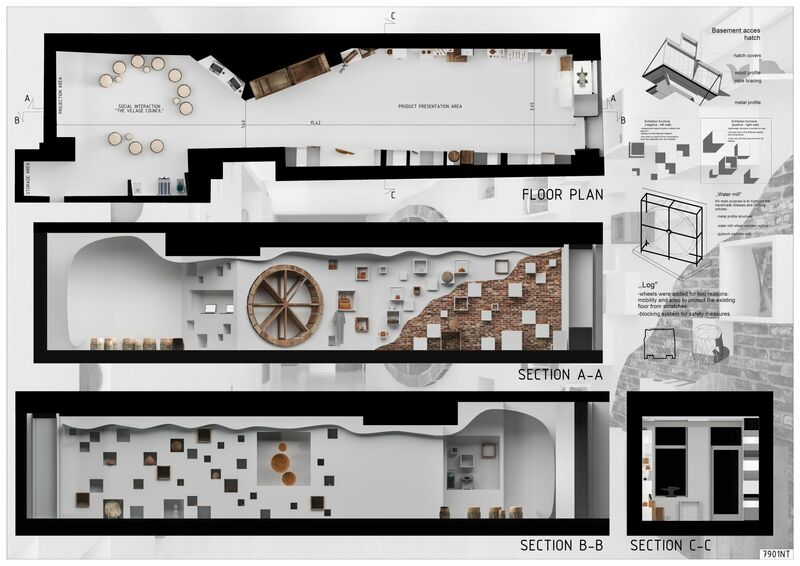 Thus, through our project we aimed to give a physical form to this concept, to create a exhibition space that would transpose the visitors into the Mesteshukars world. Since the Mesteshukars and the MBQ activity represents an interpretation, a bringing of traditional crafts into the modern era by creating glamorous contemporary “pieces of art” through the talent of the craftsmen, we naturally considered that the exhibition space must express the same feel but in a modern way. As a result, our project presents an integration of old and new alike. The space is composed by integrating contemporary furniture used to present the works of the craftsmen and elements that could be found in the traditional workshops. In order to achieve this dual space, we started our work from the walls. For this we proposed a ”composed” wall, an area were the brick would be left visible representing the old and area that would be covered and painted in white representing the present. The furniture used to exhibit the work of the Mesteshukars will be arranged by alternating full-void concept. Also, the furniture of the two opposing walls is arranged by the positive-negative principle, thus creating a contemporary exhibition space. 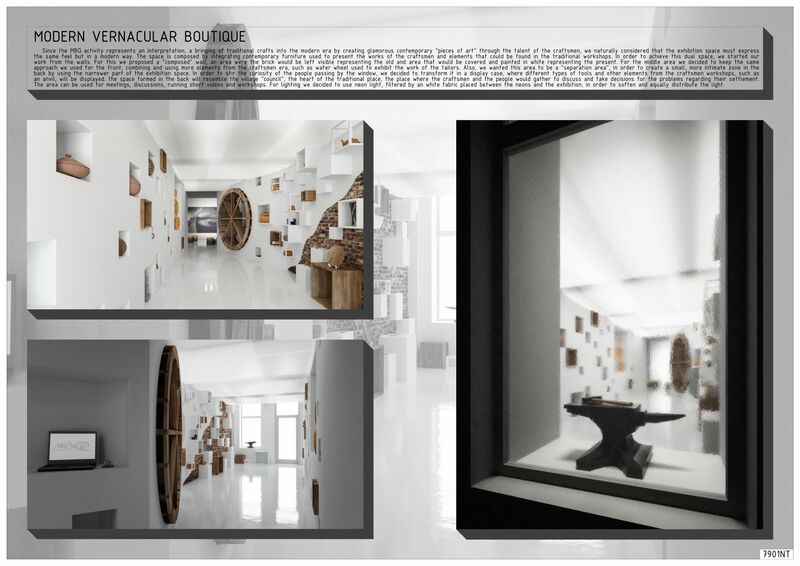 In order to stir the curiosity of the people passing by the window, we decided to transform it in a display case, where different types of tools and other elements from the craftsmen workshops, such as an anvil, will be displayed. For the middle area we decided to keep the same approach we used for the front area, combining and using more elements from the craftsmen era, such as water wheel used to exhibit the work of the tailors. Also, we wanted this area to be a “separation area”, in order to create a small, more intimate zone in the back by using the narrower part of the exhibition space. Thus the space formed in the back will resemble the village “council”, the heart of the traditional place, the place where the craftsmen and the people would gather to discuss and take decisions for the problems regarding their settlement. The area can be used for meetings, discussions, running short videos and workshops. In order to immerse the participants into the traditional village gatherings we used logs for sitting places, while the modernity of the space will be rendered by the contemporary technology such as laptops and projectors. To better express the Mesteshukar concept, a combination of old and new alike, between craftmanship and modern technology, we decided to use an industrial floor based on epoxy resin, which will represent the working area but in the same time, trough its glimmer and reflections will also represent the modern. For lighting we decided to use neon light, filtered by an white fabric placed between the neons and the exhibition, in order to soften and equally distribute the light.